Your role in this endless addictive clicker is that of a CEO of an investing firm that buys and trades stocks to make as much money as possible. 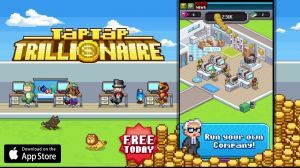 Your aim is to build an expansive economic empire by tapping, hiring traders, buying stocks, artifacts, and bonds, while also managing your own office. This incremental game is currently only available on the App store for iOS devices. No discussions open for Tap Tap Trillionaire at the moment.